Some soft, clean cloths. You'll need some for washing and some that you keep dry for drying and polishing. A dirty rag can scratch the bike. There are "wash mits" you can purchase and use, but only if they are kept clean. Clean sponges - a dirty sponge can contain dirt which can scratch paint and chrome. 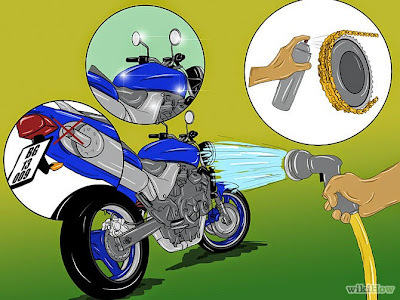 Cleaning solution made specifically for motorcycles. Because the cleaners will get on the paint, saddle and chrome, use products that are not going to cause problems with discoloring the finish or "blue" the chrome. When it comes to motorcycle cleaning, many bikers make a mistake of using the wrong motorcycle cleaning products, which can damage your motorcycle. You may want a bucket for mixing solutions. Follow the mixing directions on any supplies. Be sure each product is used properly. Of course, you need a water hose as well. If you've just come in from a cruise, you must let the engine cool down before washing the bike. You can cause spotting, streaking, chrome damage and actually crack your engine! So give the engine and pipes time to cool down.